Over the last few decades, as wild orca research has expanded, researchers have described different forms or types of orcas. Known as ecotypes, these distinct types of orcas differ in size, appearance, prey preferences, foraging techniques, dialects, behaviours, and social groups. Their ranges often overlap, but they are also genetically distinct – they don’t appear to interbreed, and rarely interact with other ecotypes. Resident orcas are fish-specialists, named so because they tend to have small home ranges around areas of large fish populations. Residents are found on both sides of the North Pacific; the Northern and Southern communities almost exclusively eat salmon, while Residents in Alaska appear to be more generalist in their fish preference, eating multiple fish species including salmon, mackerel, halibut and cod. Research by the Far East Russia Orca Project (FEROP) has shown that fish-eating orcas off the coasts of Russia and Japan prefer salmon and mackerel. Resident orcas live in family groups within larger communities, divided by matrilines and pods, and offspring live with their mother for their entire lives. These communities are genetically and acoustically distinct from each other, and each has unique traits specific to their group, like the beach-rubbing behaviour of the Northern Residents. Another North Pacific ecotype is Bigg’s, or transient, orcas. These are mammal-eating orcas, and like Residents, different communities of Bigg’s orcas specialize on different prey – from harbour seals to minke whales to gray whale calves. They live in small groups and travel frequently over large home ranges, from Southern California up to the Arctic Circle. Also very family-oriented, Bigg’s orcas live in smaller groups but form close associations with their relatives, and some offspring stay with their mother for life. Transient orcas have been recorded by FEROP in the Western North Pacific, and populations on both sides of the Pacific carry high loads of contaminants. As top predators, these mammal-eating orcas accumulate pollutants that are transferred through the food web and end up stored in the blubber of these whales. The third ecotype found in the North Pacific, little is known about the elusive Offshore orcas, as they live far from land – mainly over the outer continental shelf - and are rarely encountered. Their large range stretches from Southern California to the Bering Sea, and their social structure and prey preferences are still unknown. They are usually seen in large groups with more than 50 individuals, and have been seen preying on both fish and sharks. The teeth of Offshore orcas are often worn down, indicating that they’re eating things with rough skin (like sharks). They are the smallest of the three North Pacific ecotypes, and are more closely related to Residents than to Bigg’s orcas, though all three ecotypes are genetically distinct. These small orcas live in closely related pods and appear to be generalist eaters. They are known to feed on large runs of herring and mackerel around Norway, Iceland, and Scotland; and some have been seen feeding on seals as well. Like other orca ecotypes, different communities have different prey preferences and have different home ranges. Type 1 orcas off Norway have been observed using a carousel feeding technique, herding herring into dense balls, then slapping with their tails to stun the fish. Research on Type 1 orcas is ongoing, and photo-identification studies are gradually revealing the size and population structure of these orcas; they may be more divided into separate populations than previously thought. Type 2 orcas prey primarily on other whales and dolphins, particularly minke whales. 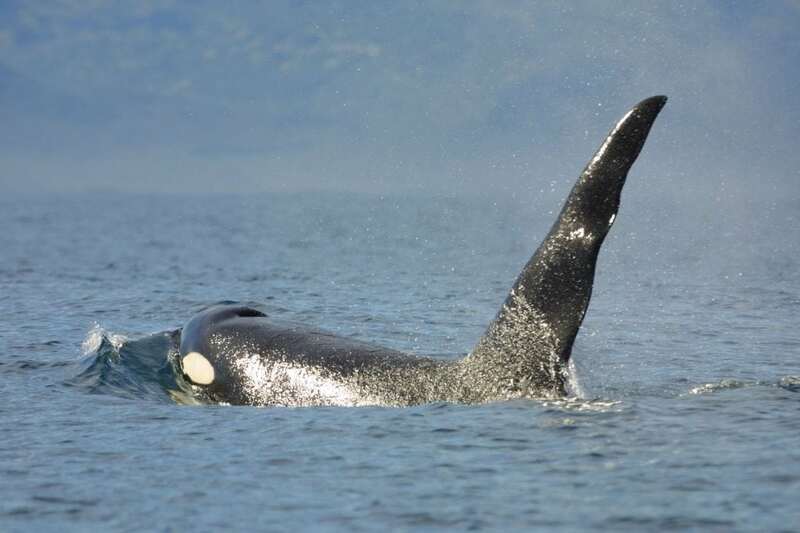 These rarely-seen orcas are large, with distinctive back-sloping eye patches, and like other mammal-eating orcas, they are especially threatened by high contaminant loads. Similar to the different ecotypes in the Pacific, the prey specializations of Type 1 and Type 2 orcas are reflected in their teeth – Type 1 orcas have very worn teeth from feeding on fish, while Type 2s have larger and sharper teeth for hunting other mammals. These large orcas (up to 31 feet, or 9.5m long) prefer the open areas of the Southern Ocean and primarily hunt minke whales, following their migration in and out of Antarctic waters. Also called Pack Ice orcas, they forage for seals in the loose pack ice around the Antarctic continent. Famous for their cooperative wave-washing hunting technique, they use their tails and bodies to create waves to wash seals off ice floes. Pack Ice orcas can appear brown or yellowish due to diatoms (a form of algae) on their skin, and they have a cape of paler colouring. 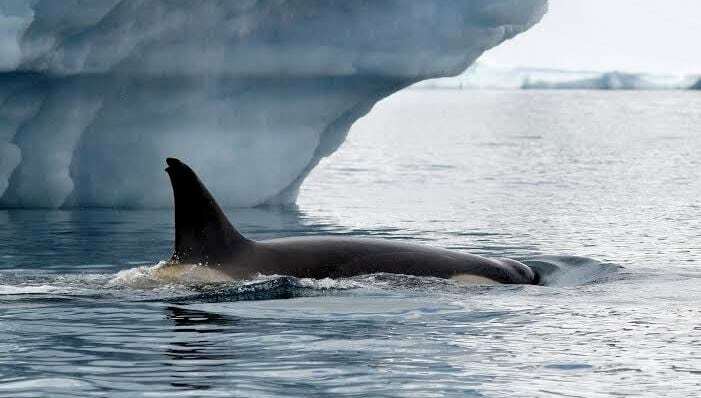 Gerlache orcas, named after the Gerlache Strait of the Antarctic Peninsula where they are most often found, are smaller than Type A and Pack Ice orcas. They also may appear brown or yellowish because of diatoms and have a cape of pale colour. The composition of their diet is unknown, but they have been seen feeding on penguins and are usually spotted around penguin colonies. The smallest ecotype is the Ross Sea orca - males reach about 20 feet (6m) long. Like other Antarctic orcas, they are grey and white and have a diatom coating that gives them a yellowish hue. The cape of Ross Sea orcas is darker than the rest of their body, and they have a very distinctive and dramatically slanted eye patch. Typically seen off Eastern Antarctica in thick pack ice, Ross Sea orcas have been seen eating Antarctic toothfish, but it is still unknown if they specialize solely on fish. Subantarctic orcas (the 5th ecotype in the Southern Hemisphere) were discovered in the 1950s in a mass stranding event in New Zealand. This was a retroactive discovery, however - at the time, they were thought to be a mutated type of the worldwide orca species. While they share the black-and-white colouring and saddle patch patterns of other orcas, these orcas have shorter dorsal fins, rounder heads, and the smallest eye patches of any ecotype, giving them a very specific appearance. Since then, there have only been a handful of sightings of this rare ecotype, but enough for researchers to realize they are a unique ecotype and not just a mutation. They have been seen consuming Patagonian toothfish, but like the Ross Sea orcas, it is still unknown if they are fish specialists. Other populations of orcas may be completely new ecotypes – not enough information is available to determine if they are separate from the ten described. Orcas in the Strait of Gibraltar, who feed on tuna, may be a third North Atlantic ecotype; , and two distinct types may frequent the Western North Atlantic and Canadian Arctic. The “tropical orca” populations around the Hawaiian Islands and in the Gulf of Mexico have so few observations that it’s not even known what they feed on – they, too, could be new ecotypes or subspecies. The resident group around New Zealand has about 117 identified individuals, who prey mainly on rays and sharks, but also fish and other whales and dolphins – not quite fitting in with any described ecotype in the Southern Hemisphere. These small populations of orcas, including the Southern Residents and those around New Zealand, do not appear to interact or interbreed with other communities, are at high risk of being lost forever. Their low numbers and our lack of knowledge have important conservation implications for the survival of these communities. By adopting an orca, by making a donation, or by fundraising for WDC, you can help us save these amazing creatures.